The Old Eau was formerly a small, natural and navigable waterway. Today it serves as part of the local drainage system. 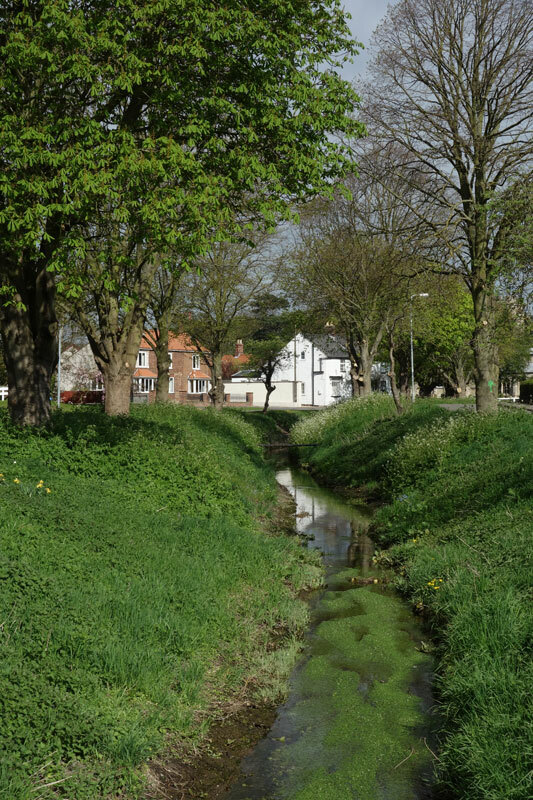 The stream that winds through the centre of the village of Bicker was once a small, navigable river that connected to an inlet of The Wash called Bicker Haven. It is called the Old Eau. How is “Eau” pronounced? Anyone who has learned a little French will usually say “ow” as in “slow” or “glow” because they recognise the word as the French for “water” and that is approximately how “eau” is pronounced in French. Many people who were born in the Bicker use that pronunciation too, as do most people who have moved here from elsewhere. But not all. Some say “oo” and a few say “ee”. Where have these variations come from? An entry in “A Dictionary of Lincolnshire Place-Names” by Kenneth Cameron (pub. English Place-Name Society, 1998) suggests that the word and pronunciation “eau” is a “spurious Frenchified form” that occurs in the Fens. The writer argues that this word has grown from the Old English “ea” (pronounced as in “bead”), a word meaning stream or river, and that this is the original pronunciation. The fact that Quadring Eaudike was written Quaderyng Eee in 1343 and Quadryngedyk in 1403 lends strength to that point of view since it is a name taken from the same water-course that flows through Bicker. Not until the eighteenth and nineteenth centuries did science attempt to give specific and universal names to plants and animals. Today every British species has a Latin name and a commonly used English name. However, the original country names that pre-date the work of the classifiers, botanists and zoologist still linger on and our language is all the richer for them. The cow parsley (Anthriscus sylvestris) that can be seen along the Old Eau in May is locally known as kek. Such names are often regional, differing from county to county. Others are quite widespread. A bird whose loud, laughing cry can frequently be heard in Bicker is the yaffle. At least that is the quite commonly used country name for the bird. It’s also the one that Peter Firmin and Oliver Postgate used for “Professor Yaffle” in the children’s TV programme, “Bagpuss”. In Lincolnshire, however, the bird was long known by the names green peek and wood-hack. Today we call it the green woodpecker (Picus viridis). A plant with a multitude of country names is the cow parsley (Anthriscus sylvestris). In Suffolk it is called cow mumbles, in northern England it is grimly known as mother-die and dead man’s oatmeal, and in Rutland and this part of Lincolnshire (and perhaps elsewhere) it has the unglamorous name, kek. 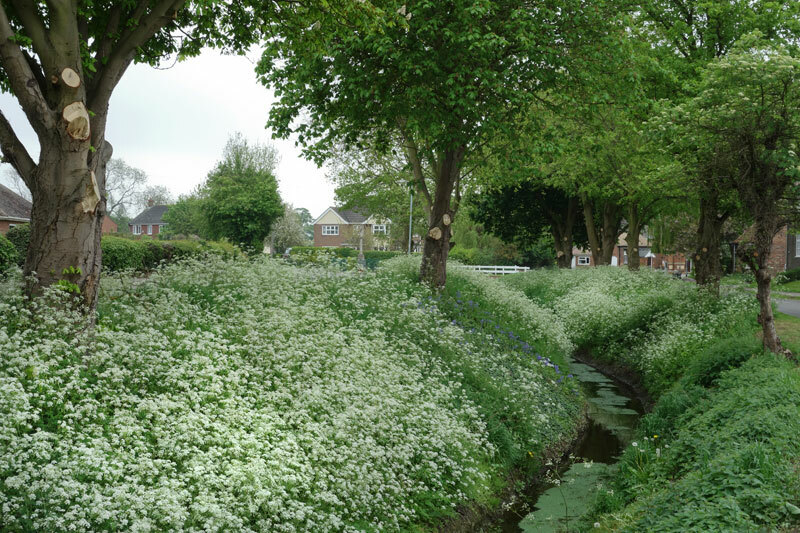 However, there are many other names for this common plant whose white flowers fill the banks of the Old Eau and the sides of the droves every May. What do you call it? A gravestone made of oolitic limestone. You can see the hole through it in the centre towards the top. 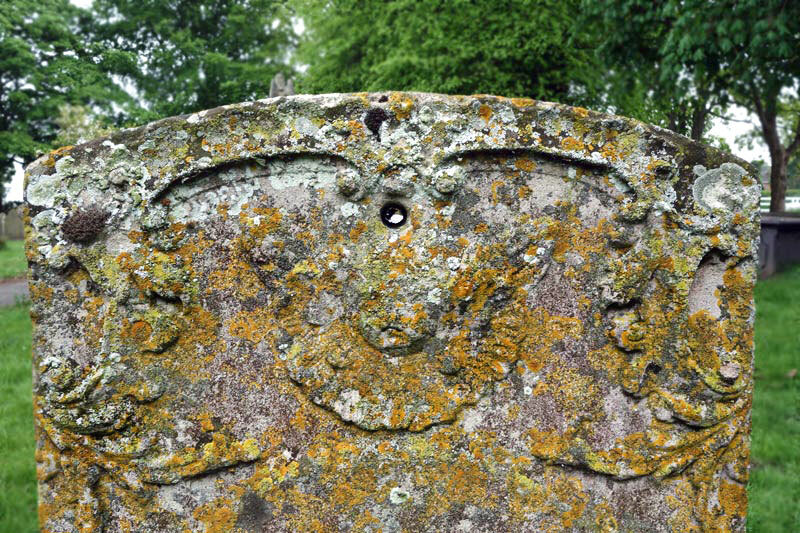 All church gravestones are holy but in Bicker churchyard fourteen of them are holey too! By that I mean that they have a hole in them. The hole in question is usually centrally placed and a foot or so below the top. 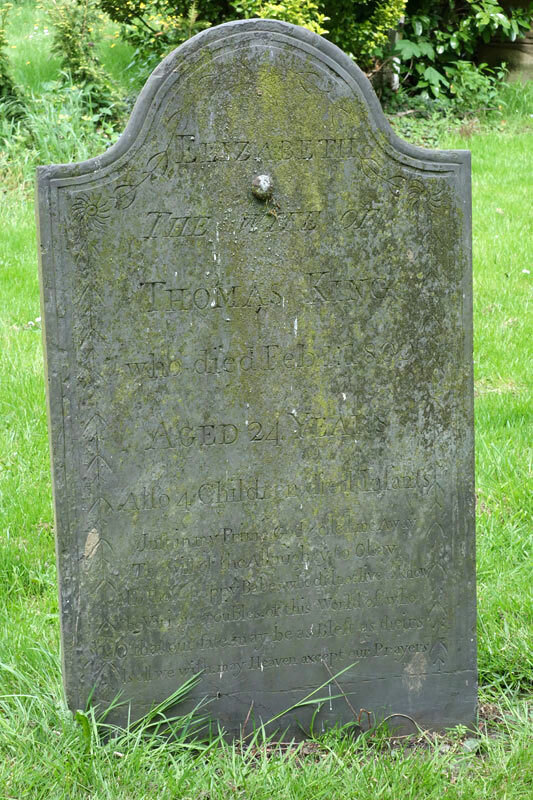 If you look at the dates on the gravestones you’ll see that those with the holes usually have a date somewhere between 1780 and about 1830. Moreover, the gravestones (headstone and tombstone are alternative names) are usually made of relatively local oolitic limestone or Swithland slate from Leicestershire. Why are gravestones made from these materials, and from this fifty year period, the only ones with holes bored right through them, and what is (or was) the purpose of the hole? A slate gravestone. The bolt remains in the hole. Bicker churchyard isn’t unique in this respect. Go to most local churchyards and you’ll find the same pattern repeated. The type of stone used in the late Georgian and Regency periods was often limestone or slate – it was fashionable. The former, though usually a hefty lump of rock, was easily carved and the stonemasons enjoyed ornamenting them with cherubs, leaves, wreaths, cartouches, and inscriptions. Slate was generally cut thinner and is sufficiently finely grained and dense to take delicate and detailed decoration. Florid scripts, borders, wreaths, leaves, flowers, medallions and much else fills the face of such gravestones. Unlike limestone which soon weathers to the point where inscriptions and decoration is illegible, slate lasts remarkably well and often today the carving is almost as sharp as the day it was done. Of course, if you specified a gravestone of one of these materials you were usually reasonably well-off and you wanted the stone to stand above your grave for many years as a marker of your passing. However, the tendency of heavy gravestones in Fenland soil is, after a few years of bedding in and the freeze/thaw action of some winter frosts, to lean slightly and for that lean to increase as the years pass. So, to counteract this, someone during the period in question, came up with the idea of boring a hole through the gravestone. Then, after the stone was carefully erected, a stout wooden stake was driven into the ground behind the headstone and a bolt was passed through the wood and the hole in the stone to fix them together. The stake was designed to keep the stone upright until the ground had properly settled around it. In order that the rusting of the iron bolt didn’t cause it to expand and crack the gravestone the hole was lined with lead. Almost every stake and bolt has long since rotted away leaving only the hole. However, in one or two locations around Lincolnshire the tops of stakes still cling to their gravestone, held by very rusty bolts, revealing the original purpose of this arrangement. In Bicker churchyard a couple of gravestones still have their bolts in place but with most of the fourteen graves that received this treatment only the hole remains.